Coventry University is committed to supporting its local and regional community and what better way to celebrate this than to honour young people who inspire others and achieve their dreams? The University recently sponsored the ‘Young Achiever’ category at the Pride of Birmingham awards. 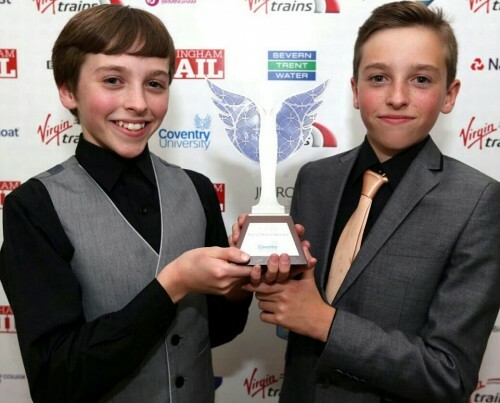 Twin brothers, Nat and Oliver Sweeney, were chosen as the winners of the award thanks to their inspiring attitude. As toddlers, they both got leukaemia and had to undergo extensive treatment. At one stage, it was feared that they wouldn’t make it, but against all odds, they did and now both of them are teenage boys with ambitions to succeed in life. Oliver plays football and is coached by staff at Birmingham City FC and Nat is performing the role of Billy Elliott in London’s West End to rave reviews. 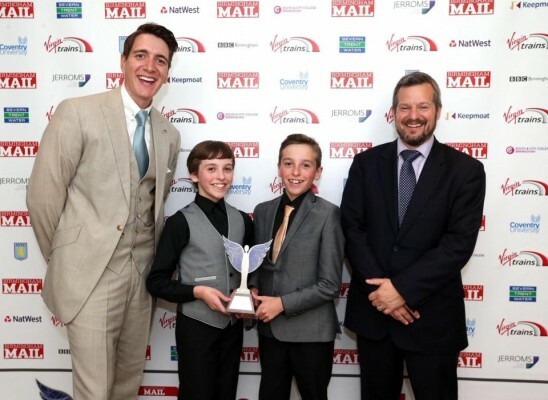 They were very popular winners on the night, both getting standing ovations when they were presented with their award by Harry Potter actor, Oliver Phelps, and Coventry University representative Aidan Friend – chief operating officer at CUSL. To overcome such a terrible illness and then go on to do what they have, just shows their determination to carry on regardless. It was for that sense of spirit and for not giving up that they were chosen for the award. Nat and Oliver, we salute you! ← The new unCOVered – uncovered!